SencorpWhite partners with industry-leading hospitals, automated pharmacy, and clean-room integrators, providing White automated storage and retrieval systems for distribution and point-of-use inventory management of high-value medical devices, instruments, implantables, and pharmaceuticals. CleanRoom Connect, an ISO Class I cleanroom dual-entry carousel. 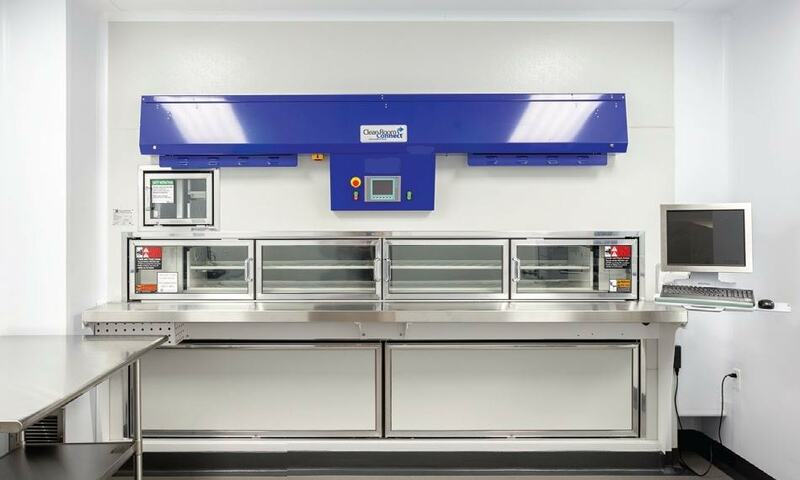 CleanRoom Connect machines allow cleanroom personnel to stay inside the compounding area without the need to gown-up or gown-down just to retrieve line items. 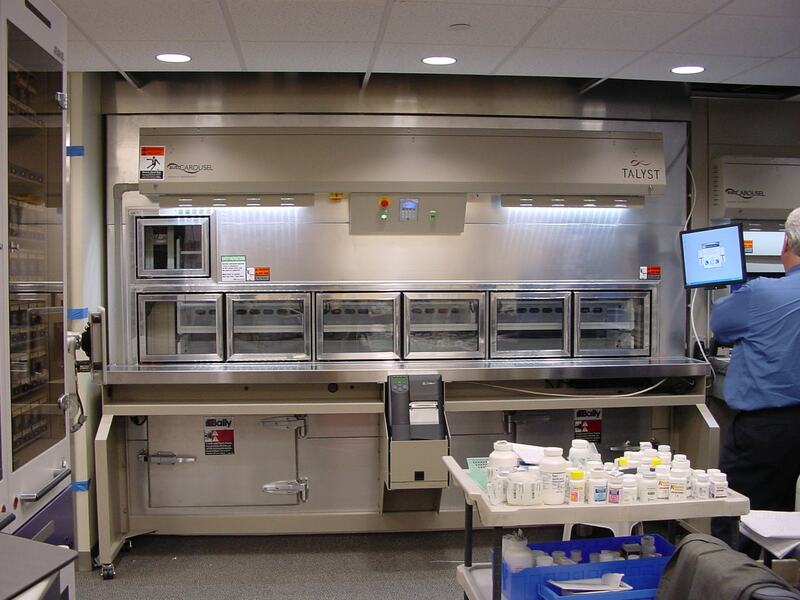 The addition of a CleanRoom Connect solution to an inventory control software system is the perfect complement to your pharmacy. And, by placing CleanRoom Connect outside the clean room a facility can save valuable square feet within the costly clean room space. The dual-access openings allow operators to replenish product from outside of the clean room, while operators on the inside have access to inventory in the unit. The machines are vented on the bottom to allow clean air to push down from the top, while inside the machines are engineered to direct HEPA filtered air around the product instead of just directly onto the product. 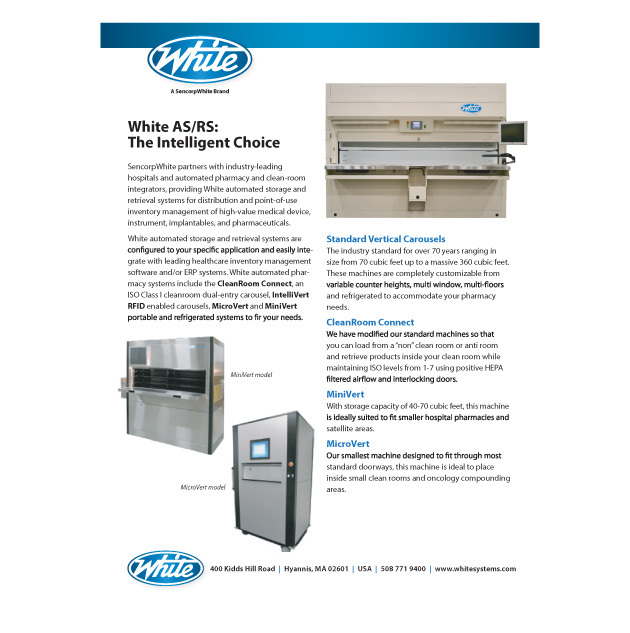 The Cleanroom Connect solution set from White will meet ISO Class 5 to Class 8 and refrigerated models are also available. Implementing a Clean Room means meeting ISO Classifications, where Hospital Clean Room requirements range in class from ISO 5 to ISO 8. The following chart shows the higher classes of clean rooms with allowable particulate numbers and sizes.